The DER catalog of award-winning films is now available by subscription via three new collections, hand-selected by DER curators and expertly suited to meet your program’s needs. DER Essential lays the foundation for the study of anthropology, with a balanced representation of classic and contemporary ethnographic films. 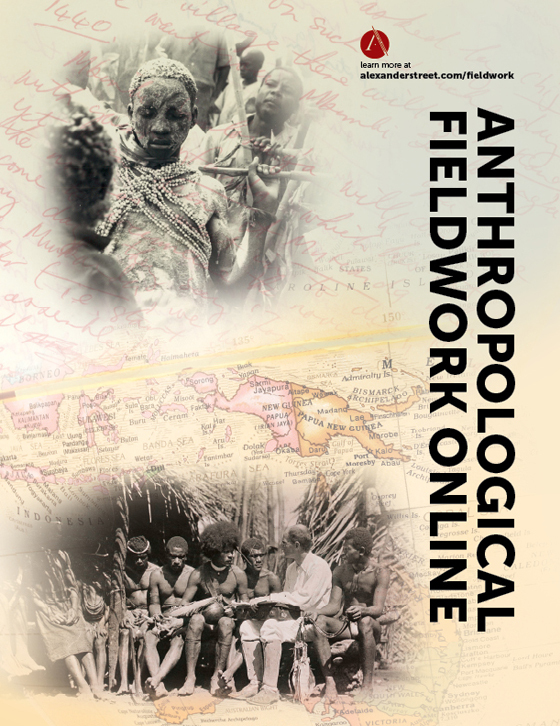 A hand-picked selection of classic titles chosen for their teach-ability at the introductory level mark the moment that anthropologists such as Timothy Asch and John Marshall began using film as a primary mode of ethnographic observation in the field. Teachers will be well-equipped to introduce a longitudinal perspective of cultures and communities over time, providing students with a framework to understand cultural change. DER Expanded includes the core, introductory titles available in the Essential package, as well as additional films to support advanced anthropology courses and related programs of study. A focal point of the collection includes a curated selection of films released within the last five years, providing teachers with tools to address current, global and trending issues, including: mass culture and its impact on traditional communities; Islam and the global world; poverty; and sustainability. DER Premium provides the most comprehensive access to the DER catalog in a streaming collection. 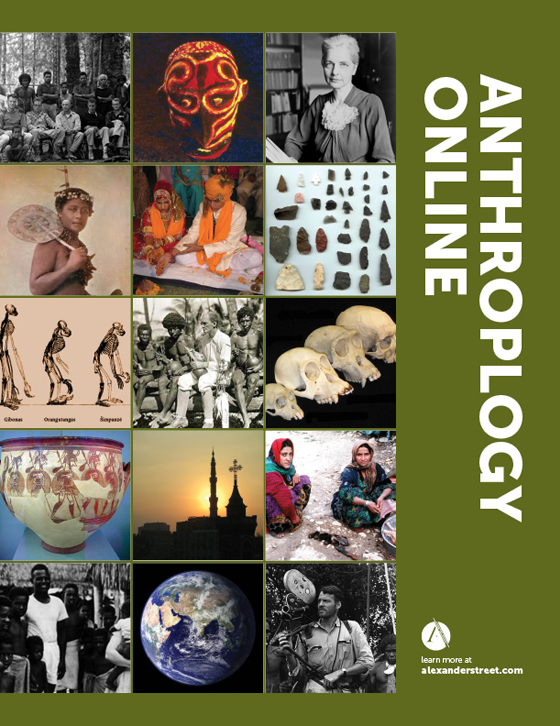 It contains the full portfolios of the great visual anthropologists such as John Marshall, Robert Gardner, Timothy Asch, and Napoleon Chagnon, as well as all new DER anthropology titles through 2015. Well suited for serious undergraduate students and graduate programs, the Premium collection is a resource for anthropological film to be viewed, understood, researched, taught and critiqued within its historic context. Collection highlights include full series such as: Timothy Asch and Napoleon Chagnon’s study of the Yanomamo Indians; Sarah Elder and Leonard Kamerling’s community-based film project with the Alaska Eskimos; and Melissa Llelewyn Davies’s Diary of a Maasai Village. 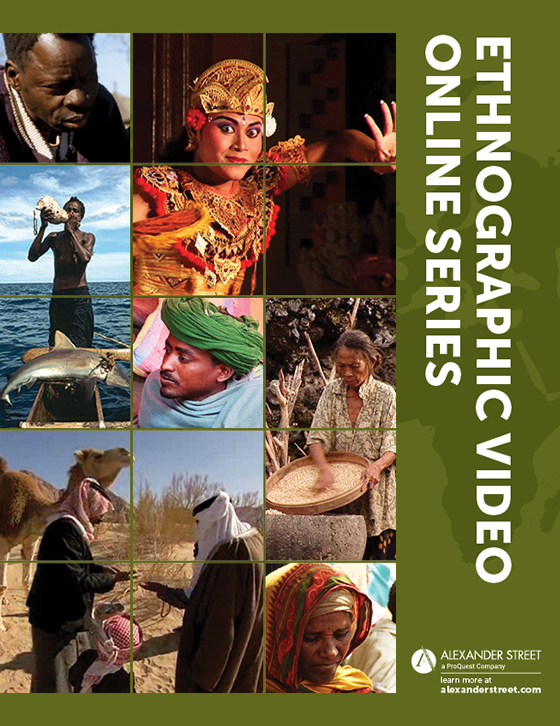 DER Premium provides access to all the DER titles you know and value from Ethnographic Video Online, Vol. I, as well as over 200 new titles available for the first time on the Alexander Street platform. This seminal series hosted by Robert Gardner served as a platform for independent filmmakers to present their films, concepts, and processes to a wider, mainstream audience. Airing between 1973 and 1980, the series became foundational to cinema and film studies, the visual arts, and anthropology. Twenty-seven of the original interviews have been digitally remastered, including those of Alan Lomax, Jean Rouch, Les Blank, and Emile de Antonio. 2016 Releases – Now Available as Single Titles! An American Mosque (2013; 27 mins): Members of the Muslim community in Yuba City, California speak openly and about the criminal act that resulted in the burning of the Islamic Center to the ground. Visible Silence (2015; 43 mins): A glimpse into the unspoken lives of Thai toms, dees, and lesbians striving for recognition, authenticity, and acceptance in a traditional Buddhist society. My Name is Salt (2013; 92 mins): Documenting the painstaking, manual harvesting techniques the Sanabhai family members undertake every year as they harvest the world’s whitest salt out of a saline desert in India. Send in the Clowns (2014; 82 mins): Performers from Clowns without Borders travel the world to areas of extreme crisis, relieving stress through laughter. This documentary focuses on their work in Haiti, before and after the 2010 earthquake. A cinematographic interpretation of the life of a group of Grand Valley Dani, who are mountain Papuans in West New Guinea (Irian Barat, Indonesia), studied by the Harvard-Peabody Expedition (1961-1963). This film was made by Gardner in 1961, before the area was pacified by the Dutch government. The film focuses on Weyak, the farmer and warrior, and on Pua, the young swineherd, following them through the events of Dani life: sweet potato horticulture, pig keeping, salt winning, battles, raids, and ceremonies. Root Hog or Die is a portrait of a living remnant of this once pervasive but rapidly vanishing way of life. Filmed in 1973 in hilltowns across Western Massachusetts and Southern Vermont, it follows the cycle of the farming year from spring to winter. In its course we visit with an array of elders, who reflect on farming's deep natural patterns, share their family histories and personal memories, and ponder the inevitable forces of technological and social change they have endured. Framing the Other portrays the complex relationship between tourism and indigenous communities by revealing the intimate and intriguing thoughts of a Mursi woman from Southern Ethiopia and a Dutch tourist as they prepare to meet each other. This humorous, yet simultaneously chilling film shows the destructive impact tourism has on traditional communities.